Me? I’m not worthy,” laughs the Royal Has-Been Flauschink Queen Paula Dietrich when asked to be this week’s profile. She had the dubious honor of being crowned in the 35th year of the distinctly Crested Butte event in 2003. Paula, along with her hubby, Jack Dietrich (Has-Been Royal Consort), also spawned the first second-generation Flauschink King, Rask (now a Royal Has-Been). Not bad for a girl from Omaha, Nebraska who claims her parents didn’t even ski. In 1980 while she was still attending WSC in Gunnison, Paula moved up to Crested Butte, where she, of course, learned to ski. 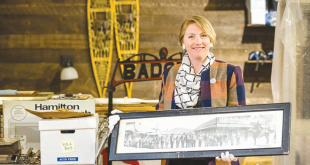 Working at the ski rental shop for a season, Paula found her niche in property management the following year with Ptarmigan, only to jump raft in midstream when her sister, Terri Terkelsen, followed her out. Together with Tim Kegermann, they started up Crested Butte Rafting. “Terry was the first one to gain notoriety in my family as the 1985 Red Lady,” Paula says proudly. In the winter the Crested Butte Rafting sisters ran with John Biro and his gang, booking snowmobile tours up to Irwin. “I didn’t guide but I did tons of snowmobiling and skiing,” Paula says. Crested Butte Rafting had permits for rivers in the state and after a decade of running them, the partners sold the business to Three Rivers Resort in Almont. When summer finally blossomed back around, Paula did what most of the townies did—played softball, the summer passion of Buttians. Regardless of all the other rigorous outdoor sports indulged in during the day, there was always enough energy for softball. Paula was on the infamous Loaded Ladies team, whose members wore skirts and wigs. “For the first ten or 15 years it was a women’s league,” Paula recalls. “We were great players, taking championships.” And the team’s captain, Glo Cunningham, had a surprise strategy that amused the other teams and spectators alike. “We’d go into the field to start the game and Glo would yell, ‘Ladies, in your positions!’ … at which point the team would drop to the ground, lay on their backs and spread their legs. That would set the tone for the game… we were a fun group,” she laughs, recalling the wild girls. From their first dates, they still like to ride together, and of dirt bikes and Harleys Paula claims, “Sometimes you just wanna cruise. The dirt bike is thrilling but Harleys are kicked-back cruisers, a totally different feeling.” She doesn’t have to share her Harley Fat Boy ride with Jack anymore. He got his very own for Christmas. But the night was young and the antics didn’t stop there. The Queen was with a girlfriend who was driving them up Elk Avenue around 2 a.m. when she spied her Royal Consort (her hubby) ducking into Talk of the Town. “I commanded her to do a U-turn and all of sudden there go the red lights again!” Paula recalls. “I jumped out of the car and said, ‘Hi, it’s me, the Queen!’ and the same cop said, ‘Really Paula, when are you going to go home?’” She breaks out into laughter, remembering her well done Promenade night. Once just a hopeful, Paula used to hold up a hand-written sign saying “WANNABE” and as a child her son Rask used to have his own sign that declared: “WILL BE.” “When I was listening to the Coronation Poem in 2011, I didn’t think it was possible! The poem starts out so generic and as it went on and on all of a sudden I heard ‘Up for the Task’ and I knew it was Rask. I was so proud. Rask was the first second-generation Royalty,” she says of the 2011 King. Paula is now the newest member of the Flauschink committee. “People would beg to be on committees if they were all this much fun,” she says of the crew that puts it all together, from organizing the parades and choosing the buttons, to deciding the next Royalty. 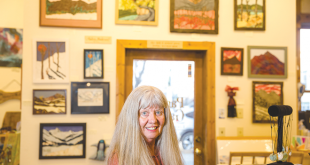 If you tally it up, Paula’s been in the same office for 25 years through different company names and ownerships, the latest being Crested Butte Lodging and Property Management. She thrives in her tourist world. “I love it! I’ve known the same homeowners forever and I love working with the tourists, people on vacations. I’ve done this for so long I can make anybody happy,” she strives to fix all issues, big or small, from plumbing to location. The Colorado life has been good to Paula from the time she chose it as a young girl. It’s given her the love of her life—her Has-Been son, Rask, 26, and daughter, Alana, 24; a couple of grandkids; the Queendom; and the dream of living in paradise doing all the things she loves. She even plans to get back into dancing after a ten-year hiatus. “I took jazz, tap and hip hop for five years with the School of Dance,” says the spirited, leggy dancer. “One of the biggest thrills for me was being onstage with Alana, my daughter, in a hip hop number when she was in high school. 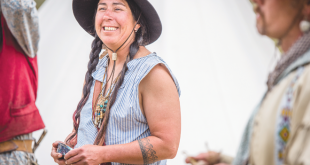 To have a mother-daughter dancing onstage at the same time, it was just so cool.” Last year she was thrilled to get back on stage in Lady Sasha’s Hip Hop classes, a staged flash mob at the base area, and Move the Butte.